When my children were little, my husband and I made the conscious decision to allow free movement, trust in the process of natural development and support our children to make decisions about their capabilities with minimal input from us. This was not always easy especially when they got themselves into precarious positions but we always ensured that we were there to spot and were able to put measures in place to make sure they were appropriately safe. The few times, the children have had accidents, they have learned from the experience and have developed a strong sense of sure-footedness as well as an appreciation of self-preservation. 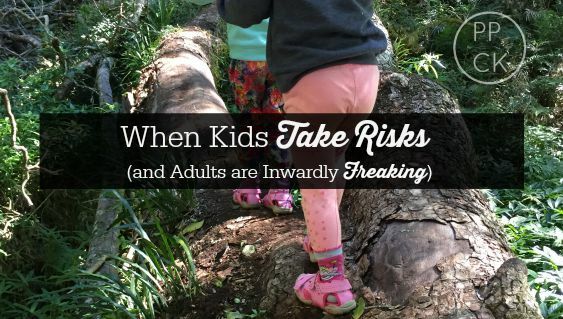 But even after years of watching my children take risks and survive, I still get heart-in-mouth moments whenever they find new ways to push themselves and test their limits. Actually I inwardly freak out sometimes, especially when the risks move up in scale. Last weekend we went on a little getaway into the country. It was a welcome break from the hustle and bustle of our city life and a break from the modern technologies we have become accustomed to. On the first day, we donned our day packs and ventured onto a nearby rain forest trail. It was a 4km loop and we knew the only way our 3 and 4 year old children would last the distance would be if we let them lead and went at their pace. They excitedly ran ahead, occasionally venturing off the track to investigate parts of nature that caught their eye but mostly they loved to run down the track. I bit my tongue when my instincts urged me to urge them to be careful of the rocks and roots jutting out of the otherwise smooth trail. Instead, when we were walking together for a moment, I exclaimed “Wow, look at all these roots and rocks poking out of the ground! Some of them look like stepping stones.” I was proud of how I was able to draw their attention to the hazards without needing to warn them of danger. We pushed on, the children were still running along and expertly navigating the hazards on the path. Soon we came to a large log that had fallen across the track and had been cut to leave a channel for trekkers to walk between. The girls were intrigued. My 4 year old, climbed straight up on top of the log which formed a bridge over a rocky, overgrown running creek below. I muttered to my husband, “Are we going to let them go across there?” He shrugged. He wasn’t sure but he urged me to trust her. She turned to look at me. “Can I cross here?” she asked. She edged a little further forward, her younger sister following her trustingly. I admit I was nervous. I imagined the condemnation I would receive if she were to fall. I could hear the cries of “negligent mother” being hurled in my direction but still I held my tongue. My husband took a few steps down the creek bank below, to assume a just-in-case position. She indicated to her sister to turn back to the safety of the wider section of the log and the two of them shuffled safely back down onto the trail before skipping off ahead. I breathed a sigh of relief. I felt proud that my 4 year old could decide the level of risk she was willing to take. I was so grateful to have been able to quash my own feelings of trepidation and trust my daughters to know their limits. 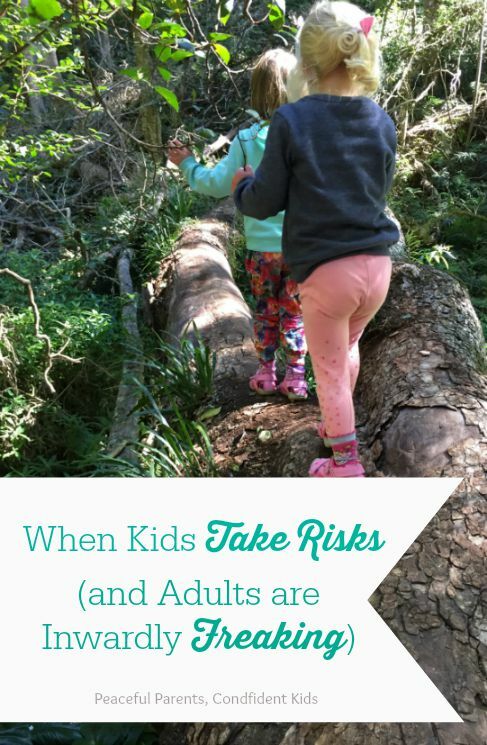 My girls love to take risks. They are adventure seekers and explore their environment confidently and capably but as we learned this weekend they also know their limits. We don’t need to step in and rescue them, we don’t even need to remind them to be careful. They ARE careful. They are deliberate and thoughtful, even when we think they are not. Yes, we had strangers make disapproving remarks about the girls climbing on this log. Like you say, we know our kids and their capabilities, we also learn way more about them through experiences like these than had we cut it short. We would have never have been witness to their thought processes and level of self-preservation had we not let them see it through. Thanks for stopping by. Great example! I find it hard to bite my tongue but it’s so worth it! Thank you, Sara! Yes, it’s so hard!! Oh I find this so difficult, sometimes I can’t even watch their risk-taking adventures. My mother is always reminding me of the dangerous things I did myself as a child, and I remember the enormous sense of freedom, fun and adventure I felt while taking those risks and try to keep my mouth shut.